Shipping is an integral part of an art transaction. 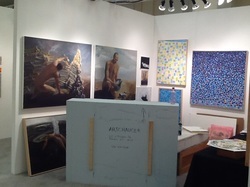 Work purchased from ARTCHAUCER art gallery is packaged to arrive safely and without damage according to shippers guidelines. Contact us for specific information about shipping costs, schedules, and logistics. We handle small and large art packaging as well as custom crating to art handling specifications.